Microsoft obviously artists and content creators to want its products. The company unveiled multiple creative-minded products at its keynote a few days ago , including a major Windows 10 upgrade called the “Creators Update” and a gorgeous PC called the Surface Studio. It has 80 custom parts in its arm alone! Most of the announcements were about advancing into the future, but Microsoft also stayed true to its roots with an update to Paint. Here are all the highlights below. Microsoft relaunched and revamped its classic Paint app with a focus on 3D. The new app lets users easily turn photos into 3D “memories,” export three-dimensional Minecraft creations, doodle in 3D, and make most anything an interactive object. Microsoft is betting people will want to view their work on the HoloLens or on a multitude of other VR and AR headsets. Users who don’t want to buy new hardware for their Paint creations can also just share their work directly to Facebook. In addition to the HoloLens platform, Microsoft announced its first foray into virtual reality with VR headsets for Windows 10. The headsets will start at $299 and run the same Windows Holographic platform as the HoloLens. While no concrete release date has been announced yet, Microsoft did say that HP, Dell, Lenovo, Asus, and Acer will all be making headsets. Live broadcasting is built into the Xbox app in the Windows 10 Creators Update. Streaming works as part of Xbox Live, allowing people to follow along with their existing Xbox Live friends. Games can also integrate comments and suggestions from viewers directly in-game. Microsoft is also updating its Arena platform to let players create their own challenges and custom tournaments. The Creators Update adds Dolby Atmos audio support to the Xbox, too. Microsoft emphasized its desire to help users interact with the most important people in their life, like spouses, best friends, and family. With the Creators Update, communications with these “key people” can be done directly in the task bar, where users can drag and drop content. Microsoft also showed off a feature akin to the Facebook poke, called “taps,” that lets people send each other stickers of 3D objects as a gentle reminder that they’re still alive. Microsoft announced the latest member of its Surface hardware lineup, the Surface Studio, a touchscreen all-in-one desktop computer that’s only 12.5mm thick. Spec-wise, the Studio has a 28-inch PixelSense display, GeForce 980M, an Intel i7 processor, and up to 32GB of memory and 2TB of storage. The Studio also has a “zero-gravity hinge” that allows the screen to tilt down at a sharp angle, allowing it to move from a more traditional computer design to a drafting board form factor for drawing and creative work. Preorders start today for $2,999, with “limited quantities” available for this holiday season. The Surface Dial is a new input device for Microsoft’s latest Surface products. The device provides haptic feedback and users twist it to select items from an on-screen menu — for example, a color picker. The Surface Studio takes it one step further, allowing you to place the Dial directly onto the screen for contextual software control. The Dial will be out in November for $99.99, but comes free with Surface Studio preorders. 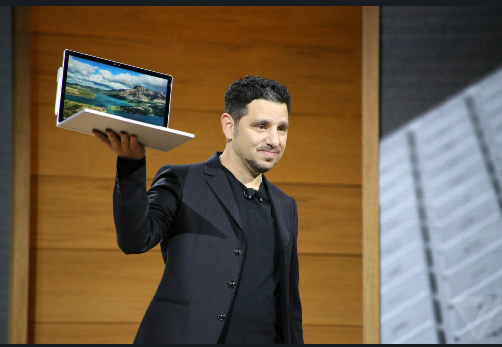 Microsoft didn’t show off a new Surface Book, but instead upgraded last year’s model to include Intel’s i7 processor and a bigger battery. The Surface Book i7 will be available in November for $2,399 and is said to reach up to 16 hours of battery life, even with more graphics power and an extra fan to keep everything cool. Microsoft is pushing a narrative in which everyone is a creator, so we’re likely to continue seeing products around that idea. It doesn’t matter whether someone prefers Excel to Paint, Microsoft wants to be a part of the creative process, however a user wants to interpret that. Microsoft CEO Satya Nadella said he wants to bring “mixed realities” to life through 3D content, AR, and the marrying of Windows with Office and gaming.